Engineered by Rob Zolner and Christian Parker in Gulick Theatre on February 4, 1993; Christian Parker in Gulick Theatre (live) on February 12, 1993, Mark Tavern in Gunnison Chapel (live) on April 29, 1993 and Christian Parker in Gulick Theater on May 8, 1993. Manufactured by Digital House, New York, NY. We thought it best to celebrate by releasing a CD (originally planned as two CDs—one of standard Saints songs and one of the material we sang at the time) as part of the reunions’s festivities during Homecoming Weekend. We knew that this meant performing a concert before Family Weekend–much earlier in the year than we typically were ready–and that would require recording the album a whole year in advance to allow time for production, design and manufacturing. To do so, we would also have to plan our membership for the Fall of 1993 well in advance, holding auditions every semester for two years to insure that the group would be at full strength and well-rehearsed in time. 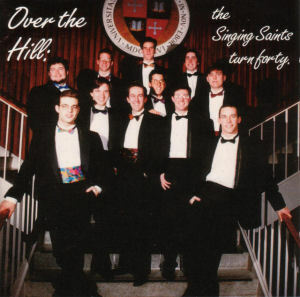 Because we didn’t have any color in the Singing Saints package, I wanted to insure that at least the cover of Over the Hill was in color. The photo was taken on February 12, 1993 just before a concert in Gulick Auditorium with the UVM Cat’s Meow. (We scheduled the concert and the photo shoot to take full advantage of our rented tuxedos.) In order to get the picture we basically took over Vilas Hall and forced all work to come to a halt. Among the other memorable parts of the shoot was finding out that Jeff Uchin’s pants were too long and rushing to find somebody in the theater costume shop who could hem them and learning that we might have to cancel the concert because one of the members of the Cat’s Meow had driven her car into a ditch enroute to SLU during a snowstorm that afternoon. Like Singing Saints, this album was financed through the generosity of the President’s Discretionary Fund; we got around $5,000 for all aspects of its production, half of it as an outright gift and half as a no-interest loan. Lisa Cania, the head of the Communications Office was also happy to donate the services of a University photographer and designer so we could have a truly professional package. The caricature was drawn by Neal Portnoy after the second Gulick Auditorium “studio” session in May, 1993. We all met at the Tick Tock after the session to celebrate. I was late and arrived to find out that the Saints already there had decided to have the caricature done. While I went back to my dorm room to get the Saints checkbook to pay for it, they decided to open a tab, so the whole night ended up being paid for out of the Saints’ checking account.